This student submission again comes from my former student Kelly Bui. Her topic, from Algebra: multiplying polynomials. The main idea of the activity will be finding an expression to represent the area of the border given the dimensions of the outer rectangle and the inner rectangle. The students will need to know how to multiply binomials and add or subtract polynomials. Therefore, this activity would be towards the end of the unit. Students will be asked to roam around the classroom or the hallway in search of items that already have dimensions labeled. For example, in the hallway there may be a bulletin board with the dimensions (2x² – 7) for the length and (3x – 4) for the width. Inside of the bulletin board, there will be the dimensions of a smaller rectangle. The question will be asked: What expression will represent the area I want to cover if I want to cover the only the border with paper? Students may work in partners or groups to put minds together to solve this problem. Every object labeled with dimensions will be in the shape of a rectangle and the math involved will require students to multiply binomials and subtract polynomials. Before students learn to add and subtract polynomials, they learn how to combine like terms such as 3x and 5x. When we add and subtract polynomials, it is very similar to combining like terms in algebraic expressions. Students will need be familiar with the concept of combing like terms before they add or subtract polynomials. To introduce the topic of combining polynomials, it can be set up horizontally. By setting it up this way, students can determine which terms can be combined and which terms need to be left alone. Additionally, students will build on the concept of combining like terms as it applies to this process as well. Setting it up horizontally will also increase the chance of preventing the mistake of forgetting to distribute the negative sign throughout the second polynomial. Once students are comfortable doing it this way, the addition and subtraction can be set up as a vertical problem where students must now take the step to align the like terms together in order to add or subtract. By taking the step to set up the polynomials horizontally before vertically, it will give the students a deeper understanding of what concept is actually behind adding and subtracting polynomials. The website http://www.quia.com provides a multitude of activities relating to different subjects. 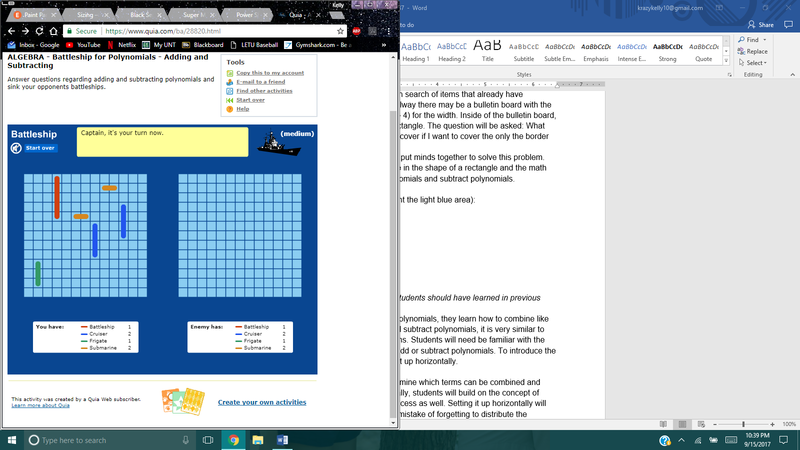 The game I chose to correlate adding and subtracting polynomials is identical to the actual game Battleship. The game can be played by anyone with access to the internet and Adobe. This game is interactive because you won’t have to perform math on every single shot fired at the enemy. If the student does hit one of the vessels, in order to actually “hit” the enemy’s ship, the student must successfully add or subtract two polynomials. If a student hits a vessel but is unable to solve the polynomial correctly, the game will highlight the hit area so that the student can try again. This game can either engage the students to see who can sink all of the enemy’s ships first, or it can be assigned as a homework assignment that requires showing work and screenshotting the end result of the game. Lastly, you can choose the level of difficulty of the game. For example, on the hard level, you must determine the missing addend or minuend to the expression, or add or subtract polynomials of different degrees. The website also offers an option to create your own activities, so if Battleship isn’t panning out as desired, it is possible to create your own game for your students.